Some things never change. Harley-Davidson is still the great, iconic American motorcycle. But like many storied companies, Harley has had to evolve to stay on top, even to stay in existence. From near-extinction in the early eighties, it has risen to worldwide recognition for management excellence and innovation. 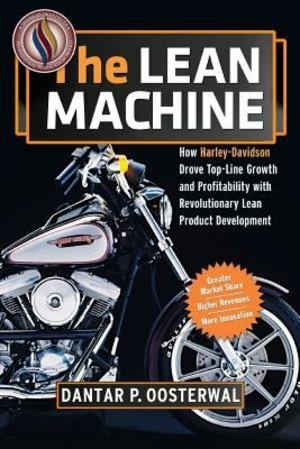 The Lean Machine is an inside look at how Harley-Davidson was able to adapt in an ever-changing world and accelerate product development. Rooted in Japanese productivity improvement techniques, Knowledge-Based Product Development helped fuel Harley's incredible period of sustained growth. Even after the company earned the PDMA Corporate Innovator Award in 2003, Dantar Oosterwal, a Harley-Davidson executive, took the improvement a quantum leap further. By implementing Lean Product Development techniques, Harley realized an unprecedented fourfold increase in throughput in half the time, powering annual growth of more than ten percent. In The Lean Machine, Oosterwal shows the day-to-day transformation at Harley and identifies universal change and improvement issues, so that companies in any industry can incorporate Knowledge-Based Innovation - with predictably excellent results.